for everyone, it’s nuances of colors are really relaxing and captivating. Every day of the year, in every season, Borgo Egnazia is like a breathing tale of Puglia, spoken by the ancient culture of the land and by the sheer beauty of its nonpareil architecture. More than just a a resort, it embodies a brand new concept of hospitality based on local, authentic experiences. Borgo Egnazia is located in Savelletri di Fasano (Brindisi), a few steps away from the Adriatic coast, the slopes of the Murgia and the Itria Valley and it’s easily accessible both international airports Bari (approx. 50 min. by car) and Brindisi (approx. 35 min by car) and from the Fasano train station (approx. 5 min. by car). The construction of the Borgo Egnazia took several years, but the result is amazing: all the elements have been defined in the smallest details, using materials typical of the villages and benefiting from the skills of local craftsmen. 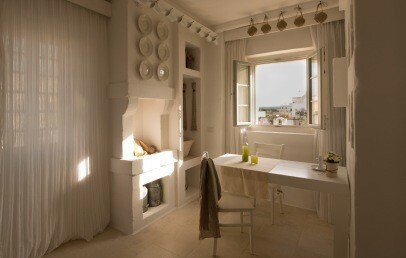 Modern and past elements are smoothly blended in this important testimony of Apulian architecture. 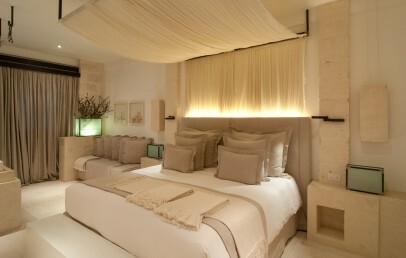 The prevailing colors at the Borgo Egnazia Hotel 5 star are white and beige, colors that reflect the local custom. The Villas (Ville) and the main central building of the Resort with their elegant and spacious rooms and suites are ideal for those who want to have a holiday of comfort and relaxation. The welfare of your stay will be guaranteed even by the Wellness Center & Spa Vair, 2000 sq.m. in which to take care of yourselves, either alone or in couple. The Borgo is ideal for families with children because it is composed of small buildings with large rooms which can accommodate both adults and children in a very comfortable way. The welfare of your stay will be guaranteed by the atmosphere of calm and tranquility that the structure of the village transmits thanks to the relaxed life in its square, church and café. La Corte consists of 63 rooms. All of them are spacious and light and are characterized by the relaxed atmosphere created by lanterns and candles, by the private balconies and the stone bathrooms. Some rooms may be connected to another rooms. La Corte Bella rooms – intimate and comfortable, are ideal for two people but there is the possibility to add a baby cot on request. The balcony offers a view of the pool or of the sea. La Corte Splendida rooms – are developed on 40 sq.m. They are ideal for 2 people, but it is possible to request a baby cot or bed. 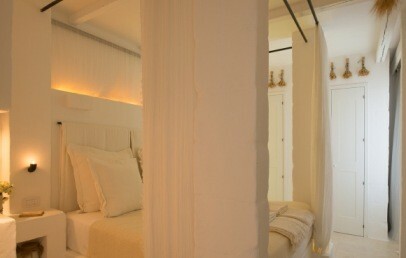 The deluxe rooms can be connected to other rooms of the same category or to a Corte Magnifica. From the balcony you can admire the sea or beautiful hills, the swimming pools and the golf course. 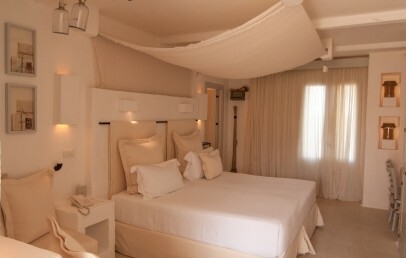 La Corte Magnifica room – is spacious, it offers many comforts and a wonderful sea view from its private terrace. 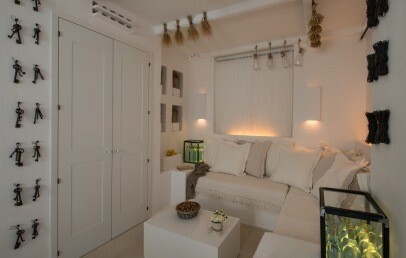 It can accommodate a third bed in the living room and a baby cot in the master bedroom. The Corte Magnifica rooms can be connected to Corte Bella or Splendida. La Egnazia – the most beautiful with 125 sq.m. surface, with two separate day zones areas, a bedroom with spacious bathroom. At the outside in the private garden is a small pool. A perfect accommodation dedicated for intimate stays and honeymooners. Please note: from June 15th to September 15th, all rooms of La Corte are reserved only for guests over 12 years. Families with children can book at Il Borgo or Villas. Il Borgo consists of 92 rooms and suites spread in different typical houses, most of them structured on two floors. Intimate and distinctive, each house has its own really well kept private garden in Arabic style. You can choose whether to book a room that belongs to the houses called Borgo Splendida or Borgo Magnifica, while the suites or mini apartments are located at the houses which names are Casetta Bella, Casetta Splendida and Casetta Magnifica. Borgo Splendida (42 sq.m.) 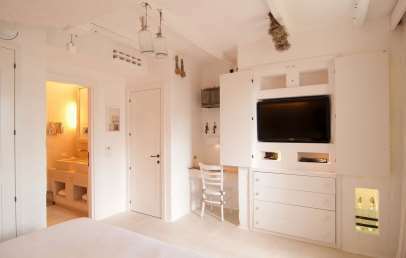 – bright and comfortable, offering a king-size bed, living corner, bathroom with double sink, shower and tub. The rooms located on the ground floor have a private patio equipped with table, chairs and sunchairs, while the rooms on the first floor have a roof terrace. On request a third bed can be added. Borgo Magnifica (55 sq.m.) – a nice accommodation for a romantic stay with a bedroom with a super king-size four poster bed and a separate living room with sofa and dining table. It offers a roof terrace equipped with table, chairs and loungers. Casetta Bella (60 sq.m.) – spacious and on two floors, equipped with many comforts. On the ground floor is the living area, a kitchenette, a bathroom and a garden patio. On the first floor there is a double bedroom, a bathroom with double sink, shower and separate a tub. Moreover a nice roof-terrace. It is ideal for two people with the possibility of adding a third bed (infant or child). Casetta Splendida (90 sq.m.) – spacious and on two floors, equipped with many comforts and can accommodate up to 4 people (2 adults and 2 children). On the ground floor is the living area, a kitchenette, a bathroom and a bedroom with bunk bed or it can be used as a studio. On the upper floor is the master bedroom, a bathroom with double sink, shower and separate tub. Casetta Magnifica (90 sq.m.) – spacious and on two floors, with many amenities and can comfortably accommodate up to 4 people (adults) or 2 couples or a couple of friends. On the ground floor is the living room, the kitchenette, one bathroom, a wardrobe/storage room for golf bags, buggy, suitcases. ON the upper floor are two bedrooms and two bathrooms. Morover a sunlit roof terrace with beautiful view over the entire Borgo. The villas belonging to Le Ville are 29. They have an area of 250 sq.m. divided in three floors (please note that the bedrooms are not located on the ground floor), equipped with all amenities. They are ideal for 6 people, but offer the opportunity to host up to 8 people with an additional cost. All guests staying in the Villas can enjoy the exclusive tailor-made amenities such as a Massaia and a Local Adviser and have access to the remaining areas of the Resort through the charming paths. The villas are differentiated by the size of the garden and the outdoor pool. In the warm months, you can also enjoy a dive or a sunbath at our two private beaches: the rocky Cala Masciola, equipped with a Water Sports centre and fresh fish restaurant Pescheria Da Vito and the sandy beach La Fonte ideal for families. Recently awarded as World's Best Wellness Spa at Boutique Hotel Awards, Vair (the Apulian word for “true”) is a 2,000 m2 “spiritual” Spa leveraging a human being’s own resources and inner beauty to promote happiness. Local ancient healing therapies are integrated in Vair’s very unique programs, the very heart and engine of our Spa’s vision, comprising treatments and “life-changing experiences” that have been specifically designed for Vair and are based on all-natural products (fresh and from our region). Borgo Egnazia provides a wide range of opportunities and facilities allowing to pursue all of your preferred relaxation and sports activities. It features three large outdoor pools (one of which is heated), one heated indoor pool, four tennis courts, alongside a boutique (Bottega Egnazia), a game room, a cigar room and a reading room. Borgo Egnazia has a tradition of ensuring good and fun holidays for the whole family. Little guests are welcome into the magical world of Trullalleri Kid’s Club, while teenagers can either attend the Marinai or Tarantari Club. So many experiences and activities wait for your children here: a real farm full with animals to take care of, bike trips, cooking classes, to name just a few. Trullaleri Kid's Club – For children from 8 months to 12 years old , the Kids Club is open daily from 9.30 am to 6.30 pm. From children aged 4 an extra service is also available until 8.30 pm. The Club includes the nursery, the playrooms, a relaxation area with soft activities for children and swimming pools dedicated to them. We organize interesting and fun workshops and sports activities. Prices and special requirements on request. Marinai or Tarantari Club – For the teenagers, aged 12 years, workstations Wii, Playstation, a multimedia PC and wi-fi are available. We organize special evenings from 8.30pm to 10pm. Prices and special requirements on request. Kid's Restaurant Da Puccetta – a magic and otherworldly place for our younger guests, where every detail and piece of furniture, from chairs to tables or the buffet, is sized to children, who will enjoy great moments of joyful playing and natural and simple dishes that change every day. According with the style of the Resort, the restaurants of the Borgo Egnazia serve the traditional regional dishes, offering a very wide variety. The presentation of the dishes never disappoints and the four restaurants are in line with the elegance that distinguishes every aspect of the Resort. "Due Camini" is an à la carte restaurant with a large veranda located in the main building of the hotel. The sleek design and well-stocked cellar are its main features. "La Frasca" awaits you in the Borgo with a rich buffet, live stations of cooking and barbecues in the central square of the village. Trattoria "La Mia Cucina" is the kitchen of the restaurant La Frasca and, in some evenings it offers a new culinary experience with typically Fasano cuisine. "La Piazza", a weekly event every Thursday in the Piazza, to enjoy and taste the delights of the Apulian cuisine surrounded by live music entertainment. "Pescheria da Vito" a restaurant for fish and seafood lovers, it is open for lunch and dinner and located in front of the sea. Guests can pick up fish from the market stall and have it weighed and cooked at their wish or enjoy it according to the Apulian tradition of raw fish. "Il Cortile" is a pleasant open-air space focusing on “live” cooking. A number of food stations allow to choose among preferred ingredients. "Da Puccetta" is dedicated to the youngest guests and located at the Kids Club. The attentive staff will follow your children by offering them a healthy and proper diet. It offers a Mediterranean cuisine based on fresh vegetables and healthy, seasonal, simple and tasty dishes. As alternatives to the restaurant you can choose among Bar del Portico, the Bar Capanno, L’Angoletto and the Caffè della Piazzetta. In the main building of the hotel are also available to guests three outdoor swimming pools and an indoor pool, a ballroom, a reading room, a cigar lounge and several meeting rooms for business meetings. We organize cooking courses at La Frasca restaurant and shopping information about a glamorous and elegant mini-shop in the main building. Small dogs are welcome. They can't access the common areas (restaurant, pool, spa etc.). They can stay in the room or have them walk along the perimeter of the resort. They get: bed for dogs, a toy (a rubber ball, on arrival), absorbent mats, water and food bowl, natural cookie (one per day, served during the turndown service). The supplement, that provides an extraordinary cleaning of the room, is to be paid at the end of the stay at the check-out: Borgo Splendida € 80.00; Casetta € 150.00; Villa € 250.00. City tax – for “La Corte” and the “Villas” the tax is € 3,00 per person, per overnight, for a maximum of 3 overnights, valid from May 1st to June 30th and September 1st to October 31st; from July 1st to August 31st the tax is € 5,00 per person per overnight, for a maximum of 5 overnights. For the “Borgo” and the “Casette” the tax is € 2,00 per person, per overnight, for a maximum of 3 overnights, valid from May 1st to June 30th and September 1st to October 31st; from July 1st to August 31st the tax is € 2,50 per person per overnight, for a maximum of 5 overnights. Exempted are children under 12 years. The city tax has to be paid on-site at the check-out. Double room with super king-size bed, ideal for two people with the possibility to add a cot, on request. 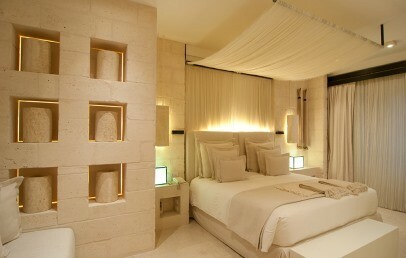 The room is spacious and bright and characterized by the relaxed atmosphere created by lanterns and candles. The prevailing colours are white and beige and there are numerous references to the typical Apulian architecture. 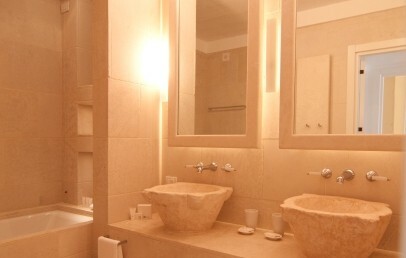 The private bathroom is are made of stone and equipped with double sink, tub, shower and speakers connected to the audio TV system. The balcony offers a view of the pool or hills view. Double room with super king-size bed, ideal for two people with the possibility to add a cot, on request. 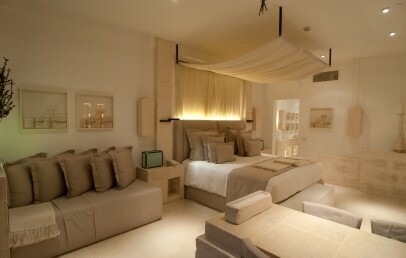 The room is spacious and bright and characterized by the relaxed atmosphere created by lanterns and candles. The prevailing colours are white and beige and there are numerous references to the typical Apulian architecture. The private bathroom is are made of stone and equipped with double sink, tub, shower and speakers connected to the audio TV system. The balcony offers sea view. Double room with double bed, ideal for two people and with the possibility to add a cot or a 3rd bed, on request. 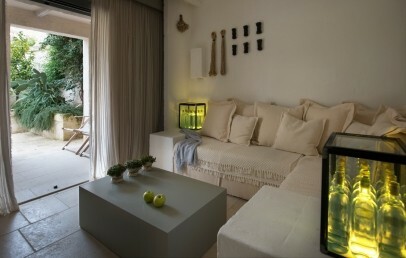 Spacious and bright and characterized by the relaxed atmosphere created by lanterns and candles. The prevailing colours are white and beige and there are numerous references to the typical Apulian architecture. The room can be interconnected to another room of the same or different category (upon availability). 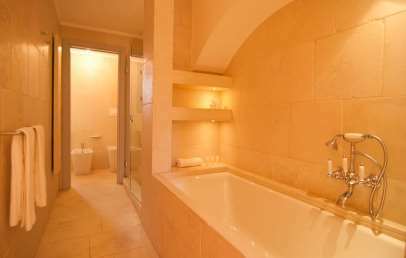 The private bathroom is made of stone with tub, shower, double sink and speakers connected to the audio TV system. The balcony or the patio offers an amazing view of the hills or of the golf course. Double room with double bed, ideal for two people and with the possibility to add a cot or a 3rd bed, on request. 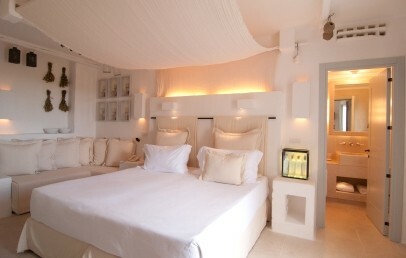 Spacious and bright and characterized by the relaxed atmosphere created by lanterns and candles. The prevailing colours are white and beige and there are numerous references to the typical Apulian architecture. The room can be interconnected to another room of the same or different category (upon availability). The private bathroom is made of stone with tub, shower, double sink and speakers connected to the audio TV system. The balcony offers sea view. Double room with super king-size bed, ideal for two people with the possible to add a cot or a bed for a child (on request). 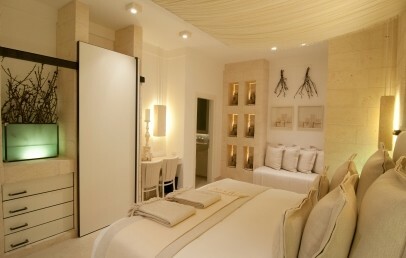 Spacious and bright and characterized by the relaxed atmosphere created by lanterns and candles. 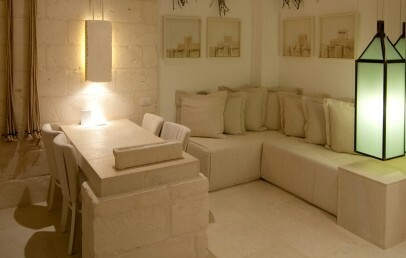 The prevailing colours are white and beige, and there are numerous references to the typical Apulian architecture. It has a living area with sofas and an elegant stone dining table for 4 people. The room can be interconnected to another room of the same or different category (upon availability). The bathroom is made of stone and has a tub, shower, double sink and speakers connected to the audio TV system. The terrace is equipped with table, chairs and loungers and overlooks the beautiful countryside, pool, golf course and the blue of the sea. Double room with super king-size bed with the possibility to add a cot or single bed. The rooms are located on the ground floor or on the first floor and are spacious and bright, decorated with the typical style of the Apulian villages. The rooms on the ground floor have a private patio with a garden, equipped with table and chairs, while the rooms on the first floor have a large terrace. The stone bathroom has a tub, shower, double sink and speakers connected to the audio TV system. A service of quality and elegance will allow you to better enjoy your stay. Double room with a four poster super king-size bed, spacious and bright and decorated with the typical style of the Apulian villages. It has a living space with sofa and a dining table. The stone bathroom has a tub, shower, double sink and speakers connected to the audio TV system. Moreover it offers a private roof terrace furnished with table, chairs and loungers. A service of quality and elegance will allow you to better enjoy your stay. 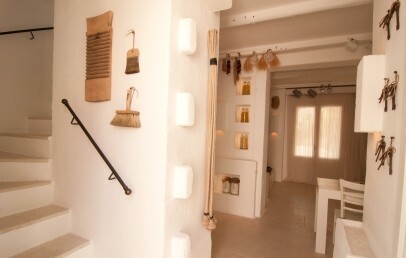 Rustic and cozy "house" distributed on two floors, spacious and bright, decorated with the typical style of Apulian villages. It offers on the ground floor a living room, a dining table, a kitchenette with fridge, kettle, Illy coffee machine, a guest bathroom and Arab-style garden patio with table and chairs. The sleeping area is on the first floor with a double bedroom with super king size bed and a roof-terrace. The bathroom is made of stone and has a tub, a shower, a double sink. Both bathrooms offer speakers connected to the audio TV system. Possibility to add a third bed either for an infant or for a child. A service of quality and elegance will allow you to better enjoy your stay.